The madness has arrived … or has it? Rizelya and Blazel are fighting a war on two fronts. Bolstered by an alliance with the ancient Phengriffs, they’ll need to defeat monsters and invaders alike if the Posairs stand a chance of surviving. Can they rid themselves of the alien menace or will their race be destroyed once and for all? 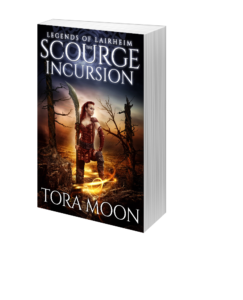 The Scourge Incursion is the third book in a series of riveting epic fantasy novels. If you like exciting battles, masterful story arcs, and intriguing magic systems, then you’ll love Tora Moon’s Legends of Lairheim series. Read The Scourge Incursion and fight against slavery today!